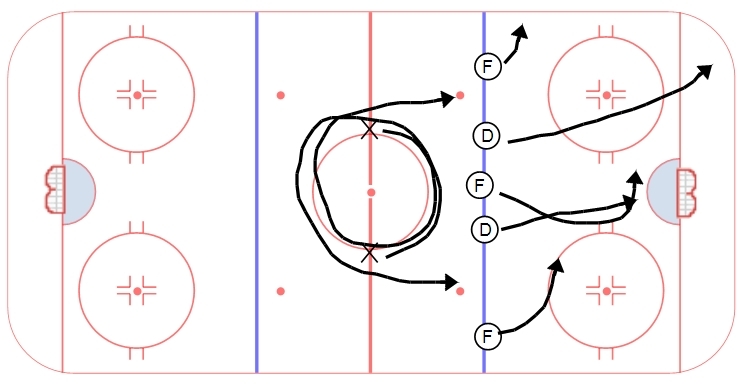 Team concept drill this week – working on forechecking and breakouts. The drill starts with five players lined up on the blue line and two forecheckers on either side of the center circle (X’s). Everyone else stands inside the circle to stay out of the way. A puck is dumped in and the two players skate around the center circle, after one lap they turn up ice to forecheck the group that is breaking out. The group of five executes a team breakout (whatever your systems are) and then dumps the puck in at center ice. Five more players have lined up on the opposite blue line and head in to break out when the puck is dumped. Two players from the first group then skate around the circle and head in to forecheck the next group. This drill is great for working on breakouts – your team will get a lot of reps breaking out against variable pressure. You can alter the number of forecheckers (1, 2, or 3) to change the forechecking pressure. When forechecking three, you can work your forwards on forechecking concepts.